We purchase Bibles at bulk rate in order to lower the cost. We purchase Bibles inside the country of distribution in order to avoid problems with shipping and customs. We purchase hardback Bibles with pages that are glued and sewn together. Paper back Bibles with glued pages are cheaper, but will not last. Our Bibles contain both the Old and New Testaments and a concordance. The concordance will be the only study tool that many believers will ever own. We sell our Bibles at a discount rate rather than giving them away for free. We take great pains to insure that no genuine believer leaves without a Bible, but we do require that something of value be given. We have given Scripture in return for chickens, fish, coffee beans, etc. By purchasing the Bible instead of receiving it as charity, the believer’s personal dignity and sense of responsibility remain intact. The believer’s offering is used to purchase more Bibles for other believers. HeartCry provides Arabic Bibles that are distributed in the Middle East. HeartCry purchases Turkish Bibles for distribution in Turkey. Bibles purchased by HeartCry for believers in the jungles and mountains of Peru. 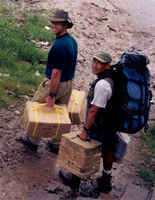 Paul and Paco Laos loading Bibles onto a boat on the MaraÃ±on River in Peru. HeartCry missionary Arturo Marin receives Bibles in San Martin, Peru. 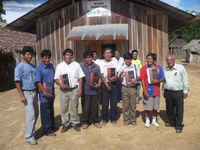 Study Bibles distributed to pastors and missionaries in the jungles of Peru. 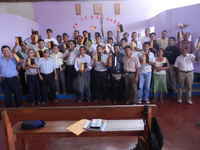 Study Bibles distributed to pastors in the jungles of Tarapoto, Peru.